-Electrocardiography for Health Care Personnel provides ECG skills training for health care students as well as health care personnel who are interested in mastering additional skills. 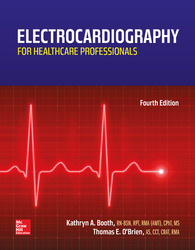 -The text includes the essential skills needed to perform an ECG, including anatomy of the heart, basic characteristics, equipment, appropriate intervention, and other technical applications, such as Holter monitoring and stress testing. 12-Leand Interpretation in a simple step-by-step format. The how-to on ischemia, injury & infarction, axis deviation, left ventricular hypertrophy, bundle branch block, and action potential. Coverage detailing attaching a patient to a Cardiac Monitor. This skill reinforces the 3 limbs referenced in Einthoven’s Triangle and gives the Lead II view referenced for Rhythm Interpretation. Quick reference cards at the end of the text to include the 5-step Process and dysrhythmia categories, plus common 12-Lead connection locations and more! Connect Plus for Allied Health Connect Plus Allied Health makes online assignments even more convenient for your students. Connect Plus Allied Health provides students with online assignments and assessments, plus 24/7 online access to an eBook- an online edition of your McGraw-Hill textbook- to aid them in successfully completing their work, wherever, and whenever they choose. Kathryn A. Booth, RN-BSN, RMA (AMT), RPT, CPhT, MS is a registered nurse (RN) with a master’s degree in education as well as certifications in phlebotomy, pharmacy tech, and medical assisting. She is an author, an educator, and a consultant for Total Care Programming, Inc. She has over 30 years of teaching, nursing, and healthcare experience that spans five states. As an educator, Kathy has been awarded the teacher of the year in three states where she taught various health sciences, including medical assisting in both a classroom and an online capacity. Kathy serves on the AMT Examinations, Qualifications, and Standards committee, as well as the advisory board for two educational institutions. She stays current through working at various practice settings as well as obtaining and maintaining certifications. Her larger goal is to develop up-to-date, dynamic healthcare educational materials to assist her and other educators and to promote healthcare professions. In addition, Kathy enjoys presenting innovative new learning solutions for the changing healthcare and educational landscape to her fellow professionals nationwide. and Critical Care arena (Cardiothoracic Surgery and Cardiac Cath Lab).